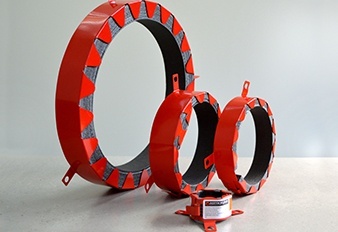 CE Pipe Collars are designed and tested to seal service penetration apertures containing plastic and metallic pipes, pipes with insulation or cables, using thermoplastic composites based on graphite intumescent technology. Developed to provide a high volume expansion and pressure seal during a fire. The X Series CE Collar offers EI120 and EI240 tested to EN1366-3, the maximum diameter being 250mm, the ultra thin design of the collar shell gives a depth of 30mm and 40mm ensuring that they can be installed into the tightest of locations. Fire Resistance testing to EN 1366-3 EI30, EI60, EI90, EI120, EI240. Pipe sizes from 32mm to 250mm. Compatible with PP, PE, PVC-U, ABS, SAN & PVC pipes.